Today started out as a regular travel day, which then turned epic, as I was given a couple of very nice surprises. 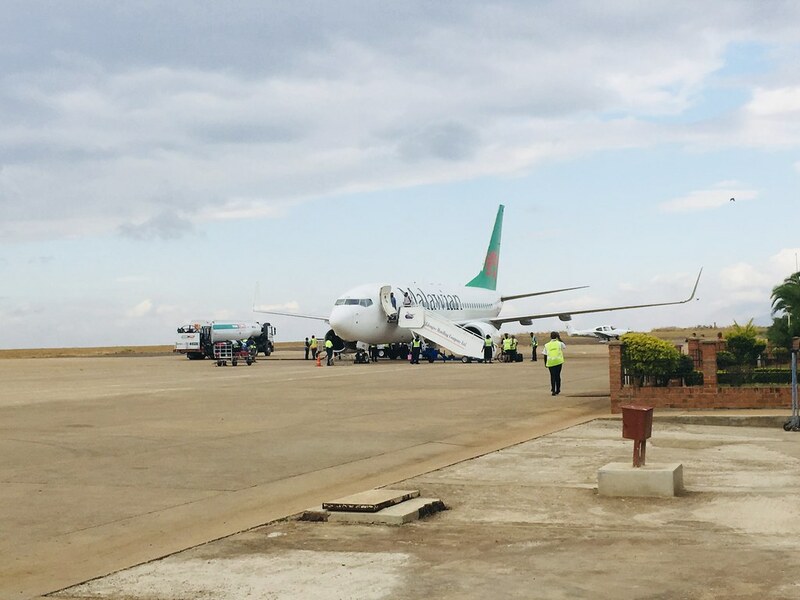 My travel plans involved flying from South Africa to Tanzania, and the cheapest flight was $150 on Air Ethiopia (actually operated by Malawian Airlines) with a stopover in Blantyre, Malawi. The day started off normal enough. I went to the Ethiopian Airlines counter, only to be told to check in at the Malawian Airlines counter, and ended up on a very full flight. Then, those of us who were flying on to Dar Es Salaam, Tanzania were gathered, and corralled into the transit waiting lounge at the small Blantyre airport, to wait for our flight to Tanzania. Nothing much to report, it was just a small room, but I spent my time writing. As it turns out, our flight to Dar Es Salaam was oversold. About 15 mins before boarding, I heard one of the airport staff call my name. He asked for my boarding pass, and gave me a new boarding pass for business class. I had gotten an op-up (explained below)! Granted, it was for a short flight on a Q400, but I was still elated. To top off my day, when I arrived at the Hyatt Regency Dar Es Salaam, after giving me my keys, the front desk agent casually mentioned that I had been upgraded to a suite as I was walking away. Talk about a great day. Op-up is a short for operational upgrade. Airlines have revenue management software, which helps them predict and manage inventory. Airlines often overbook their inventory, predicting that some customers will not show up for their flights (no shows). However, from time to time (or more often these days), everyone shows up, and suddenly the airline has a problem. Airlines often have some buffer in other classes, e.g. first class, business class, or premium economy seats available. In these instances, they will bump up economy passengers into other classes, so everyone who bought a ticket will still get on the plane. Different airlines process operational upgrades differently. There are forum (plural?) dedicated to speculating how this system works. Usually, having elite status of some sort helps, but based on my personal experience, being lucky really helps. (And this is coming from someone who is not particularly lucky). So, why was I so ludicrously excited over this? Prior to this last month, I have NEVER gotten an op-up. I am an Alaska Airlines MVP Gold, Delta Platinum Medallion (Skyteam Plus), American Airlines Executive Platinum (OneWorld Emerald), and Turkish Airlines Elite (Star Alliance Gold), and have gotten elite-based upgrades on Alaska, Delta, and American. But despite all my shiny statuses, I have never gotten an op-up. To rub salt to the wound, several of my friends and family members have gotten op-up, even with a complete lack of flying status, which goes to show the importance of luck. Sometimes, airlines are looking for a specific number of people to op-up, e.g. four, so a party of four travelers might be upgraded together. In any case, I guess the stars aligned for me this month. In both the British Airways and Ethiopian Airlines (Malawian Airlines) flights that I have gotten an op-up this month, they were overbooked in economy by one, and as luck would have it, I probably had the highest elite status. While I have no elite status with the operating airline, I probably did have the highest partner elite status. Excuse me, while I go buy some lottery tickets.